Damaged dimple on a skin, is it fatal? Can you confirm you were at full throttle during your low manifold pressure event? If so, then you have an issue somewhere. Thats really not bad at all. Two month lead time is nothing, takes me longer than that to clean the work shop sometimes.... Well maybe thats a slight exagguraton but still not a long wait. Where did you hear the news about YPK? Rob- look at the link in my reply above. ZBB is saying its a new fee as of Jauary 1st 2018. YPK still advertises free landings on their website. For -4 rivets I run 60psi, and that bucks pretty quick. Can take a bit longer in thicker material, so sometimes Ill bump the pressure up a bit. Thanks for stepping in Mitch its great to hear your reasoning and commitment to support. I totally understand Vans' position! I reckon you nailed it! I almost made it a whole build (non pre-punched -6) without drilling a hole in my finger... Almost. I also think a huge contributor to "aviation" prices is liability insurance. Oops... What he said then! I'd use tach time because its going to be less than your hobbs... More bang for the buck! In all seriousness maintenance is usually based on air time, therefore tach time should be the most accurate. Congrats!! Another beautiful machine in the air. Elk strike Oregon coast. Pilot/pax OK. Plane totaled. Never say never... I have had fish bounce off my floats, and one co-worker take evasive action to avoid a whale that breached while he was landing in a narroe inlet! Manual flap -6 or am I dumb? Scary. I can't imagine the feeling... Best of luck with everything and I'll be keeping you and everyone affected by Irma in my thoughts and prayers. I thought if it wasn't aligned right, and then torqued down, it breaks the plunger off? I think rivetless is asking for trouble. If it did start to leak it would be a heck of a job to fix. Use rivets, you can seal the tails and you won't have any issues. My neighbors think we're insane ..
How was your altimeter reading? Agreed- Nobody here has said we aren't interested in talking to anyone, or promoting our love of flying in the younger generation. Taildragger for Night and IFR flying? I used laquer thinner on a saturated rag, seemed to do the trick. I've epoxied over the area now and it seems to have stuck. Poll: Which finish do you like better? How to dimple nutplate holes on already installed firewall? I have two Proto's, love 'em both. Only thing I'm not a huge fan of with the smaller dial-type one is it doesn't ratchet. Not a big inconvenience though. 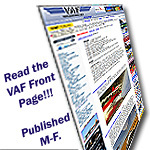 Any VAF guys around Toronto/Mississauag area? Darn! My flight benefits haven't kicked in yet. Thanks though! Bite the bullet and do it before the trip? Fire extinguisher; Yes? No? Really needed or? What an amazing program!! I would love to have taken part of a program like this when I was in high school. Maybe my kids will have the chance! Sticky: Show us the status of your 6/6A project! Congrats!! Excellent news and good luck with the test flight. You sir, have life figured out! DID YOU KNOW high speed taxi testing can potentially void your insurance policy? I painted all the interior skins with stewart systems waterborne primer, then once it was riveted together it was a pretty straightforward job to top coat it.